For a lot of people, Halloween is all about scaring people, so Michael Myers Halloween costumes are a perfect choice, especially with the Rob Zombie Halloween movie that came out in 2007. The character Michael Myers has been scaring legions of moviegoers in the Halloween series since 1978. He's been a part of eight of the nine films, and though his face isn't seen, he's still able to bring terror to the hearts of people who encounter him. Michael Myers is brilliant, mute, somewhat psychic, incredibly strong and able to recuperate from injury very quickly. He's sneaky, tall, wicked with a knife and always masked. Perhaps the best part of all for larger people looking for costumes, Michael Myers is supposed to be tall. In fact, in the 2007 Halloween movie, he is portrayed by an actor who is 6 feet, 8 inches tall. So in this case your height can actually be part of your costume. Michael Myers is scary because he's so wicked. He's described in the movies as having the eyes of the devil and being pure evil. Plus, he always kills people on October 31. What better character to portray on Halloween? 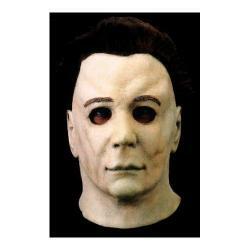 Michael Myers Halloween costumes can sometimes be purchased as a set with a costume and a mask, or you can purchase a mask and make your own "costume" for the clothes. Scroll down at Annie's Costumes and you'll find an adult Michael Myers costume and mask. Halloween Mart has a child's costume as well as the infamous mask. Costume Shoppper also sells the mask. Find Costume has a mask. There really isn't much to Michael Myers Halloween costumes, so you could easily make your own. The most popular clothing option when dressing as Michael Myers is blue coveralls, which you could buy online or in the men's department of a department store or discount store that carries work clothes. You could also just wear jeans and a matching denim long-sleeved shirt or even a blue T-shirt. Add some hiking boots or heavy work boots and a fake kitchen knife, since that is Mr. Myers' weapon of choice. It's all about the mask. The most important part of a Michael Myers costume, however, is the mask. That's the key to his whole character and what makes him scary. If you don't want to buy a mask, you could probably make your own out of a papier mâché by just covering your face. Allow the substance to dry, peel it off, and use a rubber band to keep it on your face while trick or treating or partying. If you really want to go low-budget, simply use white face paint to cover your face. This may not make your costume as obvious as would the traditional mask, but it's a great way to go if you don't want to spend money on a mask that you're only going to wear once. Remember that Michael Myers is not exactly a nice guy. Also, he doesn't talk. So if you really want to play the character the right way when you dress up, be a little hulking and menacing. Stand in a corner and if anyone gets too close, wave your knife at them. Of course, you could also be a reformed Michael Myers, after therapy, who is nice and sweet and helps little old ladies across the street. That's part of the fun of Halloween-you can take a costume any direction you want.